Perhaps an obvious starting point, geography is a crucial factor when it comes to deciding on a school. Are you excited to get out of your comfort zone and study across the country? Do you anticipate coming home every weekend? Or are you searching for a happy medium, with home being accessible (but not too accessible)? Additionally, are you looking for the pulse and energy of a city? Will the serenity of a rural setting facilitate your studies? Is suburbia satisfactory? These are important questions that call for a little self-reflection as well as some discussion with your parents. After all, they might not be so cool with you being a plane ride away. When it comes to figuring out your college list, size does matter. Some students might thrive in a 30,000+ research university. Others crave the community feel that typically permeates small liberal arts campuses. If you’re assertive and proactive, you likely won’t be intimidated by a large school. Conversely, students a little more reticent usually prefer the personal attention that’s often the hallmark of a small college. Are you hoping to become a chemical engineer? Has your lifelong goal always been to become a registered nurse? Have you dreamed of becoming a famed archeologist since the first time you watched an Indiana Jones movie? These are all noble pursuits; you just need to make sure the schools to which you apply will provide you the option. While nearly all colleges and universities have a large number of departments and disciplines, they don’t necessarily offer every conceivable major. It’s imperative that you research which choices are available as you craft your college list. College is about far more than what you cover in your classes. You want to ensure you can explore existing interests and foster new passions. Are you a budding journalist? Make sure the schools you apply to have a newspaper. Do you obsessively make mixes for your friends? See if the colleges you’re considering have a radio station. Think about if you want to be involved in Greek life or watch Division I sports or if it’s important that a school be vegan-friendly. All these facets and details can add up and enrich (or in some cases detract from) your collegiate experience. When it comes to considering applicants for admission, transcripts hold the most weight. And your transcript will be no exception. Therefore, while researching colleges, check out the average GPA and test scores of the current freshmen. Were the vast majority in the top 10% of their high school classes? Is the average SAT score a 1700? And where do your grades fall in comparison? If you’re in the same ballpark, chances are the school could potentially be a good target for you. Let’s face it - financing a college education these days is no easy feat. And the price tag is something that nearly all families must take into consideration. However, though you should research tuition, you shouldn’t necessarily rule out any schools based upon price alone. That’s because even though one institution might seem far more affordable than another, you never know what type of aid package a school will offer. Therefore, while cost is a critical point, it’s really something to revisit more closely once you have received your admissions decisions. Are you ready to begin narrowing down your college list? 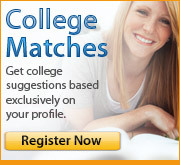 Update your My College Options account and start discovering potential dream schools today!